Sophie: I’m 19 and I started dance a bit later, but I’ve always been at Arts Umbrella. I did the high-school (SPARTS) program, all the way through and now I’m in the grad program. I heard about Arts Umbrella through friends who were doing programs in the other faculties, not even dance, but they said the dance program was really good, so I just tried it out. Dex: I come from Amsterdam, originally, and I was at the Dutch National Ballet Academy for eight years. Then, Giocanda Barbuto came to our school to do a performance piece and she told us about Arts Umbrella and we decided on coming because we wanted to do more contemporary dance, and now we’re here. I’m 20 years old and did one year after high-school of grad in Holland at the Dutch National, but realized I didn’t want to do just classical ballet, so I came here. Tell us about your piece and your process: What it’s been like working together? What inspired you? What would you like audiences to take away from your work? Sophie: It’s been great working together. I think we can both agree that we’ve never really run into any conflict. It’s hard choreographing for the first time, and sharing a partnership, because you have more things to juggle in a way, but I think we both rose to it and I think we have a really good dynamic together. The strengths I have and the strengths he has and the weaknesses — we ended up being able to help each other. I’m kind of a perfectionist and sometimes I have too many ideas and don’t know how to focus in and get something done, and Dex helped to sift through and filter. And when I don’t see something, he manages to see it. Dex: Yes, I think we were really on the same line and we’re also really good friends, which helps. I was really happy with how it worked out — I had never choreographed so it was hard doing that, and also with another person. Sophie had a lot of ideas in the beginning, and I didn’t really know what I wanted to do, so we took it all from there, and I feel it was really a shared product. I’m really satisfied with what we’ve done so far. Sophie: We both realized on the very first day that we wanted to use a big group of dancers. We imagined that because we have so many dancers available to us, and we just wanted to see what that would look like. We were a bit daunted by the task, just because this is our first piece. Dex: Especially because most of the other groups had very small groups of dancers, and we wanted to let everyone join, if they wanted to join, and be an open, shared memory with everyone. And that’s been really beautiful. And because at Arts Umbrella we have the opportunity to work with other people, we just wanted to make use of that as well. Sophie: We knew it was going to be challenging, in some ways that working with a smaller group wouldn’t, but any experience has its different challenges. At first it was a bit of a shock, but further along we figured out which were the best ways to communicate, and we learned a lot about how to talk to a whole group. Dex: And what we had to get done first before working with the big group. But also, if you think something is going to work in your mind, then you see the whole group do it, and it can really change the entire idea. Which is really cool in a way, because then you can explore it. A small idea might really change when the whole group does it and then it’s a massive idea. And that’s really cool to see. Sophie: We came in with a really strong intention, and structures, and also the meaning behind the piece meant a lot to us — the storyline — and we built a lot of structure based on that. Of course, you don’t know what it’s going to look like until you see it on everyone, and that really altered it, so we had to constantly be in the state of being very clear, but also being very open. Dex: We really wanted the group to collaborate with us, as well. And we didn’t want to make a finished product — to make a really finished thing — just a small baby piece, just so fresh and so young. Sophie: We could see it turning into a full evening work and we really had to condense it, and it’s perhaps even too long now. Sophie: We started with a very general idea — the relationship you have with your mind, and the power your mind can have over you, and how often it can prevent you from doing things, or take you down such a dark path that you feel like you can’t get out of it. We got a little overwhelmed with that idea, and we had too many ideas, so then within that theme we had to segue into another one. We went with the idea of someone having anxiety and social pressure. The protagonist in it has a lot of social anxiety and she cannot approach this one person. Dex: We tried to show her brain and what it does to her and the kind of fears a person can have in a moment and how that develops through dance, as well. She’s really seeing what her anxieties are. There are three sections. The first section is a party, and she wants to approach someone, but then she’s just too anxious to do that. She has her solo, and after her solo she breaks down and her whole mind comes open and all the good thoughts are trying to help her not to go to the dark place. Sophie: Basically, following her journey through it and her solo is based on a lot of struggle and aggression. It’s the most physical part of the piece. I think the premise is that you can pull yourself out of something. But the group represents a lot of things — they start out being people, like partygoers, then they turn into this abstract look into anxiety. Dex: We have to do lighting. 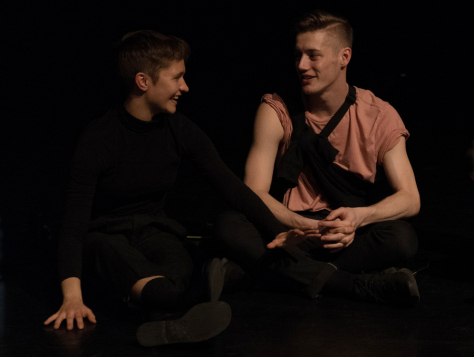 Sophie: Performing it on a stage [at the Dance Centre] has made it a lot more overwhelming in terms of decision-making. Dex: You have to do a lot more, and think about a lot more. We want to keep costumes simple, and not too extravagant. Sophie: We want to make it clear for the audience in delineating when the dancers are the partygoers or her thoughts, so we have to figure out how we want to do that, but it’s going to be very subtle and not too loud because there are so many people. We don’t want it to get too lost. With music … the first piece of music we found was for the third section, which is basically our huge theme, and it talks a lot about dark places and not going there. So that was our biggest inspiration, and from there we went in reverse and built it up. That’s how we built the piece, as well. We started in reverse because that was the big section with everyone. Now we’re actually working on the beginning, so it’s been a bit weird. Sophie: Right now, we’re so caught up in it and worried about just getting it done, we haven’t actually seen the whole piece yet or had a chance to enjoy it and start to have fun with it. Hopefully, that will happen soon. But also, I’m looking forward to seeing all our other friends’ pieces and what they’ve been working on, because we haven’t been involved in every process, and you learn so much about someone from what they choose to make artistically. Dex: Seeing how different every piece is too. Sophie: And seeing the show come together. I think the pieces are all quite diverse, from what we’ve seen so far. It’s cool to see all the pathways we can take in this artform, dance. I’m also excited to see a huge group on stage. Dex: I’m looking forward to seeing everybody enjoying the dance, because sometimes I feel we are so focused and we’re always trying to do our best, but this is a chance for us to enjoy dance and have fun with it — a different kind of fun and feeling — your friends making something for you and you’re just helping them. I’ve made a lot of connections with other people that I wouldn’t have had if I didn’t have this process. It will be a great memory. Sophie: There were so many things that are amazing about her. Dex: The thing that really amazes me about her is that she’s so fast in thinking and seeing the other side of things that are presented to her. She can really dive into things deeply and she has so many thoughts and her brain just works so fast. It’s really fascinating and I try to copy that a bit, but it takes time. She also has a lot more experience, which really shows. She just has a great way of instructing and making everyone feel comfortable and appreciating everyone’s input. Sophie: Her attention to detail is amazing, and her ability to spot something so quickly that she can question. Dex: She’s really good at re-questioning everything. Sophie: … she automatically sees it and you’re thinking ‘Whoa! I have not even thought about that.’ It’s so awesome. So, we get a bit mind-blown every time we talk to her. Sophie: We were so inspired by the second-years, last year. 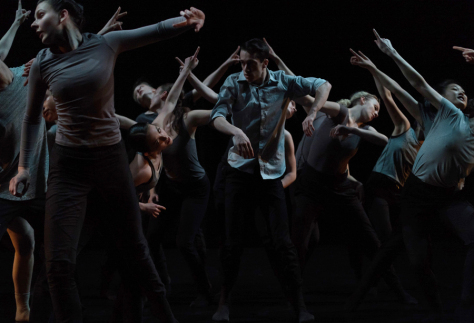 Dex: Yes, because they had a few big-group pieces [such as “Thoroughfare” choreographed by Kyle Clarke]. Sophie: And we just loved it, and how it brought the group together. We thought it was kind of essential that there be one piece like that. Last year it really helped us to feel like a part of everything. It was lovely, so that was one of the main reasons we wanted to do a big group. Dex: We didn’t have as much time with the first-years this year because we were at Ballet BC, so this is the first thing that we are all doing together. Sophie: So, it’s been nice beyond our scheduled programming with them, to do something together. Dex: I think they’ve enjoyed it and it’s been really great working with them. Sophie: There’s one more thing we’d like to add: what we’d like the audience to take away from our piece. Dex: There are some days, and some anxieties, you just have to have in order to have great moments in your life, as well. There are some bad things that need to happen. Dex: … and it needs to happen in order to make the good days a lot better. Sophie: Accepting the dark and the light and living in a place of letting go and opening yourself up to the grey, being ok with both. 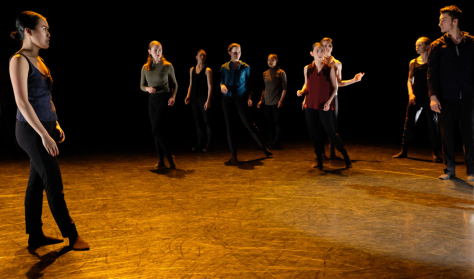 Final Question (post-performance): How did Thursday’s show at the Dance Centre affect you? What did you learn from taking your piece onto a stage? Sophie: It was beautiful to be part of this group effort, of all of us coming together to create art, and to put on a show. What was so special was that each piece, each creative process, somehow all came together to create this amazing experience that we could all share in and have an audience be part of. 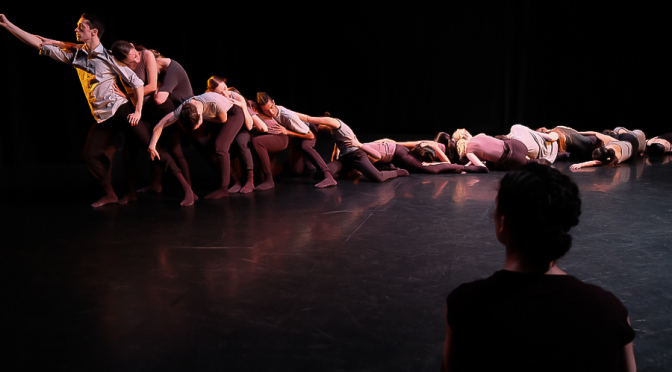 Integrating our piece into a theatre atmosphere made me see the beauty of performance in a new way. 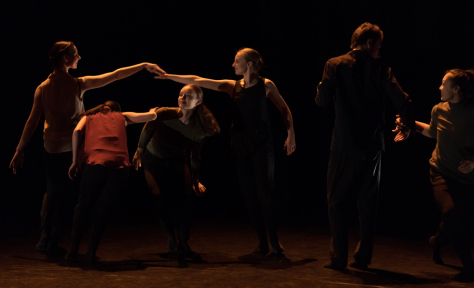 Live performance is unpredictable, it can surprise you in new ways each time, and handing your work over to the dancers and watching them embody it and make it their own on stage is a thrill. Having this experience made it clear to me that I definitely want to pursue other choreographic endeavours in the future.